Pia Wurtzbach and Xian Lim funniest moments; Mariel De Leon declares: "I think I can box better than males!" Pia Wurtzbach and Xian Lim shared jokes and quips while hosting the Binibining Pilipinas 2017 coronation night (left frame); Binibini 15 Mariel de Leon (right frame) declares during Q&A portion that she boxes better than men. 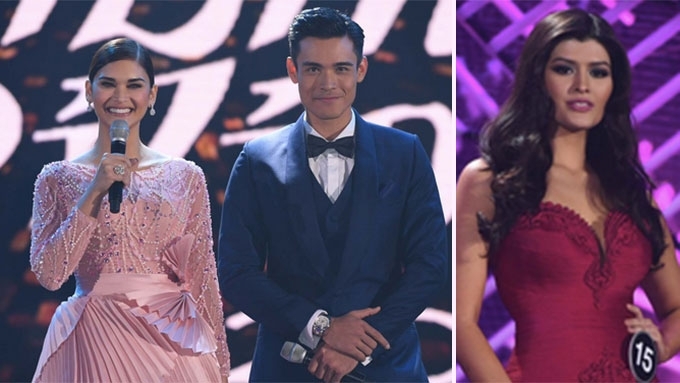 During the grand coronation night of Binibining Pilipinas 2017, hosts Pia Wurtzbach and Xian Lim uttered quotable quotes that lightened up the mood at the Araneta Coliseum last night, April 30. Some of Pia and Xian’s banters involved the Miss Universe 2015’s experience in the pageant world, including the swimsuit and Q&A portion. While doing the live pageant, there were a few bloopers onstage. The airing of Bb. 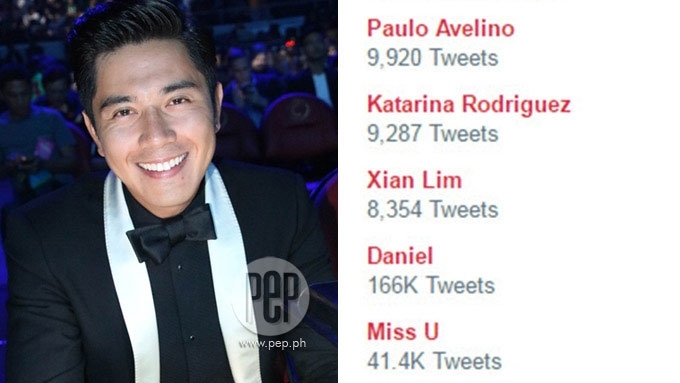 Pilipinas 2017 also resulted into numerous tweets and memes regarding Paulo Avelino who served as one of the judges that night. 1. Xian Lim pointed out that it was the fault of Miss Universe 2015 Pia Wurtzbach why high standards are given to Filipina beauty queens. When he introduced Pia, Xian remarked, “The lady right next to me is actually, siya po ang may kasalanan kung bakit napakataas ng pressure. 2. Pia realized that she has actually been part of the Binibining Pilipinas coronation night for five years. It was in 2013 since she first joined the pageant. “Three years as candidate, last year to pass on my crown, and this year as host. 3. Pia later on realized that her co-host Xian should also be awarded for his loyalty to the Binibining Pilipinas pageant. The actor-turned-TV host has been hosting the coronation night for four consecutive years: from 2014 to the present. This is apart from his first time to host Binibining Pilipinas in 2012. 4. Before the swimsuit competition, Xian asked Pia how she felt when she was about to walk onstage wearing her swimsuit. 5. When it was already the time for the Question-and-Answer (Q&A) round, the air was filled with tension. Xian explained the mechanics for the Q&A, including the time limit. The warning sounded like a shooting star sound effect. Pia tried to lighten up the mood through a joke. 6. Before the start of the Q&A, Xian asked Pia for some advice. Pia said, “You should learn how to just focus on the question, tune out all the other noise, and just make it to that round. 7. Indeed, the Q&A round can really be nerve-wracking for the candidates. Judge Mitzi Borromeo asked Binibining 13 Sirene Sutton if it's right to demand support for children in exchange for raising them. Mitzi then repeated the question. Unfortunately, the warning sound already played before she could finish her answer. 8. However, some candidates were able to show their confidence during the Q&A round. For Binibining 15 Maria Angelica “Mariel” de Leon, she was asked about her activities that were perceived to be male-oriented. This answer could be one of the reasons why she was able to get the Binibining Pilipinas 2017 International crown! 9. As hosts, Pia and Xian had their share of bloopers. A surprised Pia asked, “Oh, we are done with the first round? Despite that one blooper, the winners were announced correctly without any mix-up. Congratulations to all the winners of Binibining Pilipinas 2017 titleholders! PEPsters, what can you say about the Binibining Pilipinas 2017 coronation night?